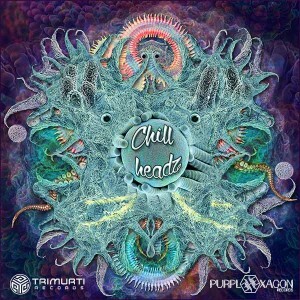 Compiled by Tuatara and Kikx, Chillheadz is the first collaboration between Trimurti Records and Purple Hexagon Records. This diverse compilation vibrates at unique frequencies with each track creating a distinct echo of celebration. Rocky, groovy and at times experimental, this collection emanates the artists’ and the underground labels’ distinct style. This journey of Exploration will first bring you deep into absolute Subterranean spaces where you will encounter the unexpected and powerful Phutoidz. Then, as the musical landscape turns Blood Orange, your Father Hormone levels will increase amongst psychedelic rock beats as you naturally drift along the flow of Styx & Stoned. You will feel peacefully drawn into the marine realm of a Love Trip and eventually lift up to the sky surrounded by Shades Of Grey. Along this intense musical path, you will fall to the scent of Namisan and breathe the halo of Gonda, temporarily resting into Ethernal Peace before shedding Heveya Tears of joy. Leave behind any expectation and embrace the journey and you will passionately love each step up the Chillheadz psychedelic expansion ladder! Mastered by Gelika @ Gelika Mastering Studio UK with artwork by Chris Kehrwider Studio. MP3 Download | FLAC Download | WAV Download · Download count: 11,660. Honoured to be involved! Thanks to Alex and all the other artists for getting this one together! takes too much of time to download…. Also, does anyone know any artists who produce something similar to the second half of Naan’s track? I really enjoyed the fast pace combined with the chill melodies. Good compilation but Naan is just superb ~ lovely, lovely track! Boah. What for wonderfull sounds!! Horr man!! I LIKE!!! I wanted to download this, but as has been said. This is sooooo slow downloading that I gave up. Not my connection!